If you’re heading from Conway to Fort Smith, here’s a list of great pie places you can visit along US Highway 64, which parallels Interstate 40. You don’t have to bring your fork, but you should go ahead and pack your appetite! Holly’s Country Cooking is open for lunch Monday through Friday. A great hut known by the locals as a haven for some of the state’s best fried chicken, Holly’s offers a selection of desserts each day, including great cream pies. 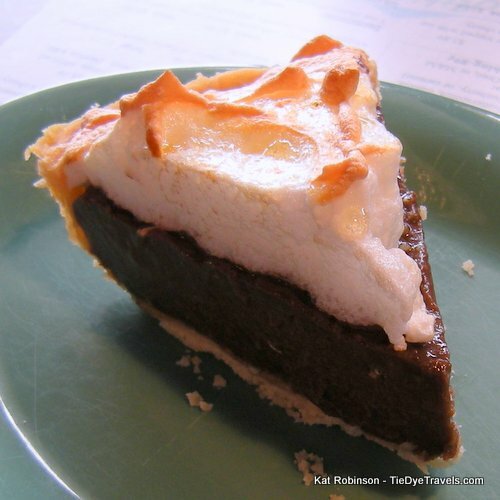 Known best for great plate lunches and ice cream confections, there’s almost always a pie on the dessert selections, and the chocolate meringue is a very good choice. The longtime classic restaurant serves up the popular Arkansas confection of cream cheese, chocolate custard and whipped cream with pecans on top. It’s almost, but not quite, as popular as Stoby’s famed cheese dip. The small storefront across from the city post office offers lunches to local workers, a really good chili and a half dozen pies every day. The caramel pecan’s sweet yet substantial filling is a love letter to your gut. A delicious icebox pie drizzled with chocolate is the perfect end to a plate of barbecue, especially paired with a Monster Melt – chilly, creamy and irresistible. This 24 hour a day restaurant inside the I-40 Travel Center always has several pies in the cooler. This one combines three great pies into one by topping a cherry and cream cheese pie with frothy meringue for the best of three worlds. Located next door to the venerable Kopper Kettle Candies, this comfortable family operation is home to the One Pound BLT. Pies vary and include such creations as the chocolate truffle pie and this cream and dried fruit pie that’s almost too reach to tackle alone. Another place known for a whole case full of pies, this one tops them all. That’s saying something, since Miss Anna’s also has the chocolate crusted, chocolate sprinkled Chocolate Pile with chocolate Kisses and a gluten-free coconut cream pie on toasted coconut crust with coconut whipped cream. But the cherry crisp, with pie cherries over a perfectly sweet-tart cream cheese custard, beats them all. Check out more photos of pies all over Arkansas here or learn more about pie in Arkansas here. I've esten pies from half of these places. I need to work on the other half.